Luten's newest, after long build-up now on our shores (thanks to Columbina for the sample). The first dab on my arm made me think of Framboise, the raspberry liqueur. Not that it actually smells like raspberries, but the boozy sweet hit reminds me of the smell of it. Almost immediately, Immortelle asserts itself, drier than the immortelle in Sables and something that smells like strong fresh thyme. Slowly, a mossy, pepperiness joins in, but never really develops much further. I don't get the licorice notes that Columbina gets (and hates), and I don't get the promised almonds. I get a pleasant mossy chypre that is rather sweet and rather... red. I hate to say it, but I am rather indifferent to this one, leaning towards not liking it. It's sweet, it's red, it's only vaguely mossy and I find the immortelle at the same time overpowering and rather...dull. As I type this, I am checking the sky for storm clouds lest I be hit by lightning for finding a Serge Lutens creation dull, but there you are. I will give this one more of a try later on, since I've had Serge's that I have had to try several times before the "eureka!" moment, but I am not pawing at the counter at Barney's, charge card in my teeth, murmurring "gimme" over this one. If that moment happens in the interim between me typing this and it being put up, I'll let y'all know..
P.S.- the moment never came. It's nice on me, but not wonderful. smell the tart juice and the bright oil of the peel. I also get something that smells a bit like orange flower, but it's just a whisper like the ghost of summer on a fall day. After a while, the Madarin/Satsuma bit starts to take a backseat to the spices (I smell clove and nutmeg) as well as some smoky tea. Labdanum is in there, adding depth and mystery. At the end there's musk, not a lot, but enough to ground this scent is a way that's just captivating. I like this one far more than Chypre Rouge, and frankly cannot fathom why this is in the exclusives and CR isn't. Perhaps that's me being selfish, but this would be a perfect late fall/early winter scent that I would happily pop for if it was at Barneys, but am not going to go the operatic friendship-straining depths (aren't y'all glad you only know me on the internet?) that I was willing to go to over MKK or Chene. While I like it miles more than Chypre Rouge, I wouldn't recommend you doing so either. I got home to send this (yes, I do write on company time, In my job, if you're typing, you're working) and read Patty's excellent comments. She nailed what I felt about the two "Mandarine-Mandarin is everything I wanted Chypre Rouge to be, though they aren’t the same in composition..."
Mandarine-Mandarin reminds me of the holidays in a way- Satsumas in your Christmas stocking, spices, wreaths, cashmere blankies and warm hearths. Wonderfully comforting. I may have to rethink that importuning on my friends thing. Now who do I know who's going to France? 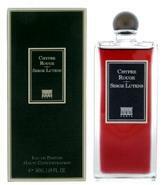 Chypre Rouge is now available Barneys at $120, since like Daim Blonde it is a Haute Concentration. Mandarine-Mandarin is only available at the Paris salon for 100 Euros. How I wish it was the other way around. You might try layering with Ambre Sultan- that combo really nails it. I also suspect that a smidge of Vetiver Extraordinaire would be amazing with it and cut the sweetness for you ! Try it, you might like it ! As much as I was irritated with Chypre Rouge, I adore M-M, I'm glad you are loving it too! That immortelle is very present in CR. I think I liked it more than most people. That's exactly how I feel about Chypre Rouge, "I am rather indifferent to this one, leaning towards not liking it". I wish I could express an opinion on Mandarine, but I still have not received my decant. Grrr. I think you may have been spared the lightning hit because I've been hit so many times for continuing to find it unremarkable each and every time I've sampled it. :-( Haven't tried MM yet, but I'm increasingly sure it will be a must have for me...thank God for Ebay, despite the budget busting prices. I'm one of those rare freaks who much prefers CR to MM. And I'm gonna try Chaya's layering thing - I guess with CR is her intention. What's not to like about a female BO/curry/sugar syrup combo? Eh? Eh? I like CR fine--but, like you and L, find it unremarkable. I enjoy MM much more, but I think I will be satisfied with the 1/3 oz decant I managed to obtain There are certain Serges that do move me to go through the mishagas necessary to obtain a bell jar, but so far, this is not one of them. I'm trying not to buy more! Don't make me! I just wish it was easier to get. I'll have to sniff Fd'O. I haven't yet. CR was a diasppointment. I think you'll like MM better- but I don't think you'll be blown away. BTW- did it take about 300 years for you Nez a Nez samples to arrive? MM is a little more. If it works on you, more power to you. On me it just missed. 301 years to be exact. And when they finally arrived, two samples were open and of course leaked all over the package. My poor home still faintly reeks of BERRIES. Mine hadn't leaked, but the bag they were packaged in was wholly inadequate for a trip across town, never mind a trip across the ocean. But I'm still gonna test 'em. In the interest of science, natch. Oh stop it! I don't want to try MM, I don't! I can't hear y'all mmm mmm mmm lalalalalala. Immortelle dull? I also won't hear of that. Wait, it will save me money! Yes, yes, dull, unbearably dull. It's dull. Dull I tell you! Back away from the MasterCard!!! Oh phooey...I just got my sample of Chypre Rouge on Tuesday, but haven't tried it yet. Doesn't sound so hot. Looks like I'll be hitting eBay for a sample of Mandarine Mandarin, though. Just when I swore I was through ordering samples for a while...oh, the lies we tell ourselves! I found Mandarine-Mandarin quite difficult to describe but you've done a great job, Tom! I just smelled it again, and what I'm getting is smoky celery that eventually grows into sophisticated spicy amber. Love it! I wish I liked Chypre Rouge more, too. Yes, I've told myself time and time again that I won't be ordering samples for a while. A while usually ends up being about eight minutes. Thanks! That's nice of you!